When it comes to wedding expenses, the cost of wedding flowers are typically surpassed by only the wedding venue reservation and the reception’s catering (including cake and drinks, of course); the bridal bouquet alone can cost up to $200, and bridesmaid bouquets usually costs between $30-$60 a piece! To help you stay within your budget, Hollywood Banquet Hall offers a step-by-step guide to creating beautiful, D.I.Y. (Do It Yourself) bouquets for your upcoming wedding. Read on! Remove excess foliage, leaves, and thorns using the stem stripper and carefully pull away damaged or unattractive flower petals with your fingers. Fill the bucket with fresh water, and hold the stems underwater while using the stem cutter or knife to cut them about 2 inches from the end. Keep stems in the water bucket throughout the bouquet-making process. Taking four stems and arrange flowers together in a square shape – this will serve at the center of your bouquet’s “dome” and all other flowers will be arranged around this core. Use a rubber band or wax floral tape to bind the stems at the place where they naturally join (about 3-4 inches below the flower heads). Continue adding flowers, one at a time, to the core until you achieve the desired shape and size. This process should take anywhere between 30-60 minutes per bouquet. Once the bouquet is finished, cut the stem ends so they are all the same length (7 -8 inches is a good length) and dry them off with a paper towel. Cut a length of ribbon about 30 inches in length, then use pins to secure the ribbon to the top of the stems (near the flowers). Proceed to wrap the entire length of the stems, starting at the top and working your way down then back up again. Add a bow (optional) by cutting a separate length of ribbon and tying it beneath the flower heads. 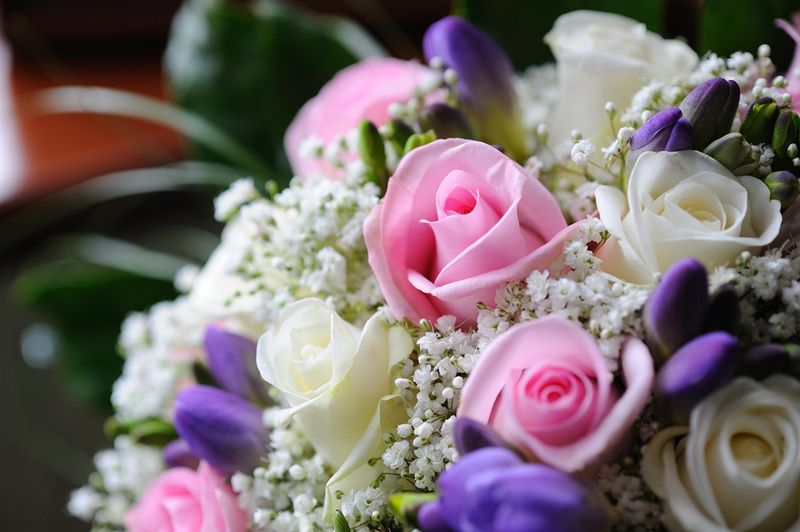 Though its best to make your bouquet the morning of your wedding, we realize that’s not always possible. If you must store your bouquet for a few days before the big day, carefully wrap the bouquet in tissue and store it in the refrigerator until you are ready to leave for the ceremony.